Advanced training for more experienced skippers building on the Day Skipper course. This course is held at our Hammersmith Clubhouse in London. It will equip you to navigate safely on coastal and offshore passages. It is necessary prior to taking your Yachtmaster or Coastal Day Skipper practical exams. Course Duration: 40 guided learning hours either as Evenings and/or mixed in with weekends. NOTE: a minimum of 1.5-2 hours homework per week will be required in preparation for each session ! Course Description: This course will take your theory knowledge to the standard required for the Coastal Skipper and Yachtmaster Offshore practical exams, concentrating on advanced navigation and meteorology skills. The course is taught over 40 hours with three exam papers. Content covers position fixing, course shaping and plotting, tidal knowledge, use of almanacs and admiralty publications, electronic position finding equipment, taking and interpreting forecasts,plotting weather systems, weather predictions using a barometer and by observation, collision regulations customs and excise regulations for cruising abroad. Next Steps: RYA Coastal Skipper or RYA Yachtmaster Coastal if Yachmaster exam was passed. Cross Channels, further afield cruises and Racing with LCSC. 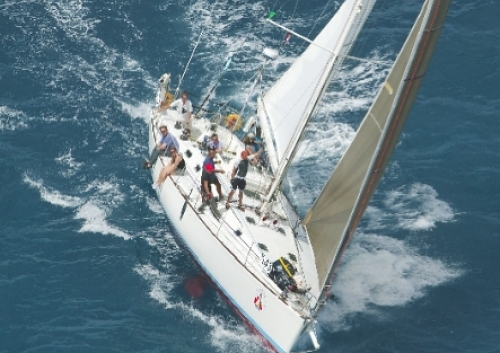 Ability after the course: The RYA Yachtmaster Theory course will provide you with the theoretical knowledge to become an RYA Yachtmaster Offshore, or give you the confidence to sail you boat on coastal passages by day of by night.